Facing new challenges in areas such as Immersive Environments, Digital Games and User Experience and broadening the knowledge in Computer Graphics. 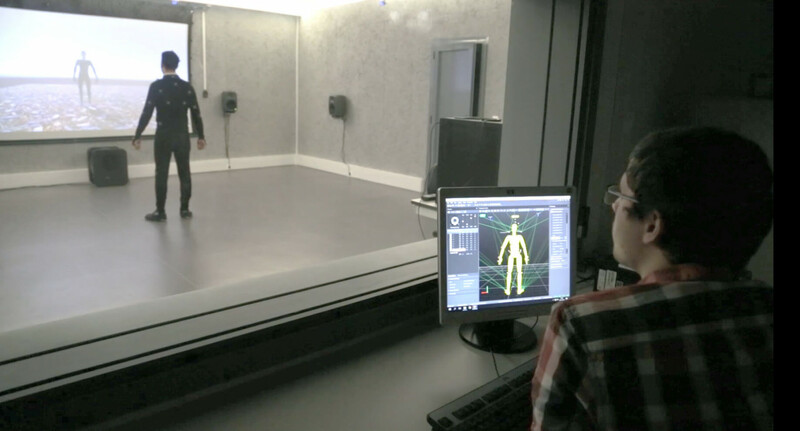 The Laboratory of Computer Graphics and Virtual Environments (CG&VE) is equipped not only to face new Challenges in areas such as Immersive Environments, Digital Games and User Experience, but also to broaden the knowledge in Computer Graphics, in areas such as Image Rendering and Visualisation. The research team is composed of approximately 20 PhD senior researchers and also post-doc and PhD candidate research fellows who conduct their research at CSIG. Initially created in Porto in 1985, the Laboratory of Computer Graphics and Virtual Environments has nowadays a new state-of-the-art laboratory in Vila Real ‑ the MASSIVE (Multimodal Acknowledgeable multiSenSory Immersive Virtual Environments) Laboratory. Multisensory Experimental Room: provided with a tracking system, acoustic treatment, proper ventilation and climatisation to handle temperature and odour delivery; can be configured to support a controlled environment for psychophysical research. Immersive visualisation in VR (3D or 2D): Projection systems, HDR screens, HMDs and Oculus EyeTracker. Equipment for olfactory stimulation in VR: Butanol Sensitive Kit, Scentroid SM-100, Vacuum Chamber. Equipment for Multimodal Interaction: Microsoft Kinect v. 2.0, Myo Gesture Control Armband, Leap Motion hand tracking. Equipment for Augmented Reality: Google Glass. Tracking and measurement of psychophysiological signals: Optitrack, SMI eye tracking (Monitor), SMI eye tracking glasses (SMI-ETG) for smart recorder, Emotiv Epoc+ Premium, Nexus X, Emotif, VitalJacket. Exploration in VR: Omnidirectional treadmill and a Virtusphere. 3D Printing: BQ 3D Printer. This prototype combines 360º 3D video with 3D sound and smell. The demo consisted of transporting the users to a coffee shop and immersing them in the experience by introducing the smell of coffee. More details on this prototype can be found on DR9[WU1]. This demo was developed to validate the integration of haptic stimulation and consisted of simulating the bumps felt by the passengers during a car ride. The demo gives the visual and audio stimuli as felt during a car ride. These were captured using a video camera and the bumps were simulated through a vibration equipment synced with the video that was installed on a chair where the user is sitting during the demo. This demo consists of an interactive virtual environment where participants were on a trail riding a bicycle down a hill. A stationary bike was used where the user could sit and participate in the virtual experience. The exercise was developed in order to be used on a preliminary case study and it was also valuable to evaluate and validate the authoring tools. This prototype simulates the training of firefighters, helping to observe the fire and heat behaviour in closed spaces, and works as a first contact with the high temperatures that are felt in closed spaces with an active fire. The simulation consists of having the users in a closed container where it is possible to visually watch some fire behaviours. The heat is also an important variable and it is stimulated through a temperature vest. More details on this prototype can be found on DR8[WU2]. This prototype was built based on actual firefighter drills. The simulation features a container that simulates a closed space where the user must to enter and find a person laying down on the ground. The user has to overcome through a set of obstacles, locate the victim and extract them from the closed space. Framework for multimodal gestural input. This framework can be used to develop applications that are independent from gesture-recognition devices and gesture-recognition methods. Need additional information about the	Laboratory of Computer Graphics and Virtual Environments ?